Wakatobi Resort is known for its spectacular reefs, diverse marine life and world-class diving and snorkeling opportunities. Those qualities alone attract travelers from around the world, but there is another facet of the resort operation that guests find equally appealing. Despite its remote location, Wakatobi delivers a first-class resort experience, combining a magnificent natural setting with luxurious touches, fine dining and premier levels of personal service. A key element of the Wakatobi experience are the accommodations, which have evolved from relatively modest beginnings into a premier collection of Villas and Bungalows. We invite you to discover the history, beauty and elegance of our island-style lodging. In the early years, Wakatobi was known only to adventurous dive travelers. These first guests were willing to make a series of day-long sea and land transfers to reach the resort, and to sleep in the more dormitory-like accommodations of the Longhouse, which housed all elements of the operation under a single roof. The reward for these pilgrimages was a chance to dive reefs that were fast gaining a reputation as some of the finest in the world. As word spread, it soon became obvious that expansion was needed. But a key concern for growth was preserving the ambiance of the site. When founder Lorenz Mäder first discovered the scenic swath of coastline where he would build Wakatobi Resort, the beach was lined with a majestic stand of palm trees. Erecting a large hotel on the site would have meant clearing this grove, and the end result would not provide the levels of privacy, comfort and natural beauty Lorenz envisioned. It was decided that expansion would take the form of private bungalows and villas set among the palms, built in a traditional regional style to complement the surroundings. As with the original Longhouse, Lorenz wanted to honor local traditions and technique for design and construction. There were both practical and aesthetic reasons behind this decision. Like homes in nearby villages, each bungalow would be constructed on stilts and fitted with large windows. This design kept moisture and bugs at bay, and also enhanced the natural airflow. By employing village carpenters, Lorenz supported the local economy, and tapped into a labor force that was highly skilled in the requisite building techniques and styles. All work was done with hand tools, and structures were fastened with wooden pins rather than nails. Native woods and locally quarried limestone were used extensively, and roofs were finished in sago palm shingles. Inside, beamed ceilings, rich wood paneling, hand-carved masonry details, traditional furnishings and Indonesian artworks were used to evoke an atmosphere of classic island elegance. 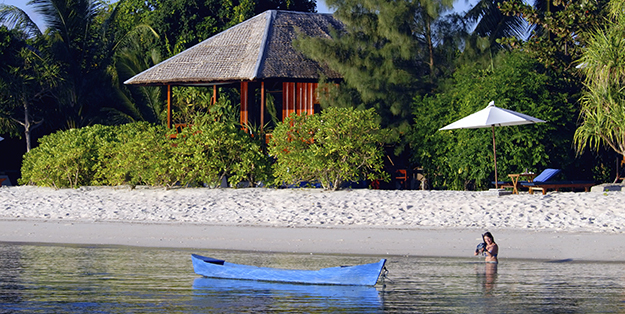 Over several years, Wakatobi added 24 individual bungalows to the resort grounds. Fifteen now sit on the edge of the beach, providing direct ocean views, while another nine are nestled into the palm grove, still just steps from the beach. Based on their location, these accommodations were originally designated either as Garden or Ocean Bungalows. They exuded local charm, while also providing modern creature comforts along with much more personal space than the typical hotel room. Guests soon discovered the pleasures of lingering over morning coffee on their private veranda, watching sunsets over the water and falling asleep to the soft sounds of the tropical night. Bungalows exuded local charm, while also providing modern comforts, along with much more personal space than the typical hotel room. For a property located in such a remote corner of the world, Wakatobi’s accommodations were considered quite luxurious. But that was just the beginning. Over the ensuing years, each bungalow would see a series of upgrades, and eventually undergo a name change as the resort moved towards a level of hospitality that is known as “barefoot luxury.” The transition from Beach to Grand Bungalow included the installation of air conditioning, which was most appreciated at certain times of the year when cooling sea breezes diminished. Personal refrigerators were added to each bungalow, furnishings were upgraded, and telephones and safes were installed. A subsequent second wave of Grand Bungalow upgrades included the addition of larger front porches, satellite Internet, enhanced lighting and Asian-style outdoor showers. The most recent enhancements to the current Ocean Bungalows included additional upgrades to furnishings and lighting, built-in wardrobes, and remodeling of the shower rooms. The Garden Bungalows have received many of these same upgrades, and are now known as Palm Bungalows. Wakatobi’s next step on the road to barefoot luxury came with the creation of a new class of accommodation known as the Villas. In 2004, the first Wakatobi Villa was built on a low bluff at the north end of the beach. Three more followed. Villas provide panoramic views of the reef and ocean, along with upscale touches such as sculpted stonework and indoor/outdoor spaces. Currently, two of the villas have a single bedroom with large, private deck space, and the other two provide two full bedrooms and baths with private pool and large deck area. Villa two and four also feature an ocean-view bathtub.